The award-winning Black Box is designed for guitar players who want to stretch the creative potential of the guitar. With an inspiring array of unique effects that automatically beat-sync to your song tempo or the included drum patterns, the Black Box allows you to quickly access intricate delay lines, randomized filters, pulsing feedback effects and countless other ways of jumpstarting the songwriting process. 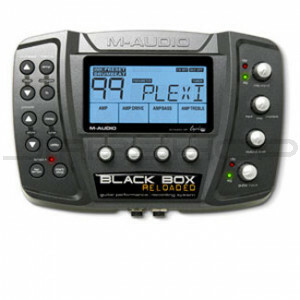 Co-developed by M-Audio and Roger Linn Design, the Black Box is the first creative tool for guitarists that combines amp modeling, powerful beat-synced effects and a drum machine with a Pro Tools M-Powered compatible audio interface for computer-based recording.